Preprints (earlier versions) of this paper are available at http://preprints.jmir.org/preprint/6061, first published Jun 01, 2016. Background: Mental disorders are highly prevalent and associated with considerable disease burden and personal and societal costs. However, they can be effectively reduced through prevention measures. The Internet as a medium appears to be an opportunity for scaling up preventive interventions to a population level. Objective: The aim of this study was to systematically summarize the current state of research on Internet-based interventions for the prevention of mental disorders to give a comprehensive overview of this fast-growing field. Methods: A systematic database search was conducted (CENTRAL, Medline, PsycINFO). Studies were selected according to defined eligibility criteria (adult population, Internet-based mental health intervention, including a control group, reporting onset or severity data, randomized controlled trial). Primary outcome was onset of mental disorder. Secondary outcome was symptom severity. Study quality was assessed using the Cochrane Risk of Bias Tool. Meta-analytical pooling of results took place if feasible. Results: After removing duplicates, 1169 studies were screened of which 17 were eligible for inclusion. Most studies examined prevention of eating disorders or depression or anxiety. Two studies on posttraumatic stress disorder and 1 on panic disorder were also included. Overall study quality was moderate. Only 5 studies reported incidence data assessed by means of standardized clinical interviews (eg, SCID). Three of them found significant differences in onset with a number needed to treat of 9.3-41.3. Eleven studies found significant improvements in symptom severity with small-to-medium effect sizes (d=0.11- d=0.76) in favor of the intervention groups. The meta-analysis conducted for depression severity revealed a posttreatment pooled effect size of standardized mean difference (SMD) =−0.35 (95% CI, −0.57 to −0.12) for short-term follow-up, SMD = −0.22 (95% CI, −0.37 to −0.07) for medium-term follow-up, and SMD = −0.14 (95% CI, -0.36 to 0.07) for long-term follow-up in favor of the Internet-based psychological interventions when compared with waitlist or care as usual. Conclusions: Internet-based interventions are a promising approach to prevention of mental disorders, enhancing existing methods. Study results are still limited due to inadequate diagnostic procedures. To be able to appropriately comment on effectiveness, future studies need to report incidence data assessed by means of standardized interviews. Public health policy should promote research to reduce health care costs over the long term, and health care providers should implement existing, demonstrably effective interventions into routine care. Mental disorders remain highly prevalent worldwide with lifetime prevalence rates varying between 12.0% in Nigeria and 47.4% in the United States . In 2010, the largest contributor to years lived with disability were mental and behavioral disorders . In addition to the high disease burden and premature mortality, mental disorders also represent a financial burden for both, people affected and society [3-5]. Because care and treatment options and results remain limited , the focus should be on the reduction of the incidence by prevention measures. There are 3 different types of prevention. Universal prevention is focused on the general population (including those without special risk factors). The focus of selective prevention is on subgroups at risk of developing a (mental) disorder (increased risk compared with the average population), whereas indicated prevention targets subgroups who show subthreshold symptoms (ie, not fulfilling full diagnosis criteria) . Regardless of the type of prevention, prevention measures should lead to a substantial reduction in the incidence of the target mental disorder. Consequently, for assessing the effectiveness of preventive interventions, an initial disorder-free target population is needed. In addition, current incidence data collected by means of standardized interviews (eg, Structured Clinical Interview for DSM Disorders [SCID], MINI) are required [7,8]. Together, this allows for calculating the incidence rate ratios (IRRs) and number needed to treat (NNT). The NNT indicates how many people would have to receive an intervention to prevent one new case of the target mental disorder (“effort”), whereas the IRR is an indicator of the “impact” of a preventive intervention . Recent reviews and meta-analyses indicated that prevention of mental disorders is feasible and can lead to a substantial “impact,” that is, reduction of incidence rates of mental disorders [9-13]. The Internet as medium for delivery has been identified as an appropriate way to scale up preventive interventions [14,15], needs less effort in provision, and has several additional advantages over traditional (ie, face-to-face) prevention settings. Internet- and mobile-based interventions (IMIs) are flexible (participants can integrate them easily in their daily lives and work at their own pace) and anonymity might be appealing for those fearing stigmatization . Furthermore, in the setting of limited health care resources, IMIs have been found to be cost-effective [17-19]. A large number of people can be reached as a result of decreased personnel and infrastructure costs, especially those in remote areas without easy access to health care services . Considering the worldwide rapid growth of Internet usage during the last decade , health care services and particularly mental health professionals could benefit from IMIs as an alternative or supplement to existing and traditional interventions . There are few reviews and meta-analyses to date summarizing empirical findings on IMIs for the prevention of mental disorders. The literature yields reviews on prevention of eating disorders (EDs) [23,24], and substance-related and addictive disorders [25-27] in adult populations. Regarding ED, the review by Schlegl et al  integrated a wide range of intervention and prevention trials. Concerning prevention, they presented a mixture of relapse prevention (2 studies), treatment of subthreshold ED (2 studies), and primary prevention trials. Unfortunately, the wide range of studies and outcome parameters did not allow for meta-analytical pooling. Beintner et al  focused on a single ED prevention program for students called StudentBodies. With regard to content, substance-related and addictive disorders prevention programs are often focused on health behaviors and health promotion, rather than on psychotherapeutic variables [28,29]. In summary, none of the previously mentioned reviews summarizes and evaluates the existing literature of Internet-based interventions for the prevention of mental disorders in general and with a clear reference to the previously mentioned statistical criteria (initial disorder-free target population, reporting of incidence data by means of standardized interviews). Consequently, health care providers and public health policy makers are unable to gain an overview of the effectiveness of IMIs for the prevention of mental disorders. This systematic review and meta-analysis fills this gap in research as understudied disorder groups, intervention types, and populations are detected. It aims to (1) describe existing studies on Internet-based preventive interventions, (2) assess the quality of included studies, (3) evaluate the intervention effectiveness, and (4) highlight understudied subfields of research (eg, certain disorder groups or intervention content). This systematic review has been registered in the PROSPERO register (registration number CRD42015026781). It was conducted according to the PRISMA guidelines . A study protocol that describes trial details has been submitted on December 17, 2015 . Studies were eligible for inclusion if they (1) focus on an adult target population, who (2) were without a diagnosis of the target mental disorder at baseline (primary prevention intervention). (3) Mental disorders had to be assessed by means of standardized interviews (eg, SCID ), validated self-reports (eg, Beck Depression Inventory-II ) or clinician-rated scales (eg, HAM-D  with normed cutoff points or diagnosed by health care professionals). Studies on the prevention of substance-related and addictive disorders have been excluded, as this represents a frequently-studied and already reviewed specific subgroup of prevention research [26,27]. (4) Interventions needed to be based on psychological interventions. The definition of “psychological intervention” was taken from Kampling et al  and refers to cognitive behavioral therapy (CBT), psychodynamic psychotherapy, behavior therapy or behavior modification, systemic therapy, third wave cognitive behavioral therapies, humanistic therapies, integrative therapies, and other psychological-oriented interventions. (5) Interventions must be provided in an online setting, defined as online, Internet, Web, or mobile based. Interventions may vary concerning the amount of external guidance provided to participants. Self-help interventions will also be included. We excluded studies on the relapse prevention of mental disorder, as these treatment maintenance interventions differ substantially from preventive interventions focused on the first or recurrent onset of mental disorders . (6) Studies had to include a control group. This could be either (enhanced) usual care, wait-list control group, another intervention, or no treatment. (7) Studies examining onset of disorder were included, defined as percentage of persons who developed the mental disorder under study from pre- to follow-up-assessment. In addition to data from standardized clinical interviews (eg, SCID-IV ), we included studies reporting only symptom severity scores, when validated rating scales with normed cutoff points (referencing onset of disorder or diagnosis) have been used. To be able to comment meaningfully on any postintervention reduction of incidence, studies had to (8) include a follow-up assessment at 3 months or longer after randomization. (9) Only randomized controlled trials (RCTs) that are available in full text will be eligible for this review. For an overview of the eligibility criteria, see Table 1. A systematic database search was conducted. Databases included are The Cochrane Central Register of Controlled trials (CENTRAL), PsycINFO, and MEDLINE (search date August 17, 2015). A sensitive search strategy was developed and applied for each database . The search was complemented by a review of reference lists from identified publications and a hand-search of the World Health Organization International Clinical Trials Registry Platform (ICTRP) to include ongoing trials. When indicated, study authors have been contacted to obtain further information to clarify study characteristics. When study protocols were identified without subsequent publication of results, authors have been contacted to obtain missing or unpublished data and determine eligibility for inclusion in this review. The selection of papers was conducted by 2 independent reviewers (LS, LR). In the first step, authors screened all titles and abstracts yielded by the database search. In the second step, the full texts of the selected articles were retrieved and screened in terms of the aforementioned eligibility criteria. Reference lists of all articles included in the study were screened in the same way. Disagreement at both screening levels was resolved by discussion. Concurrent validity of the 2 reviewers was examined. Figure 1 shows a PRISMA flow chart to illustrate the study selection process and reasons for exclusion . Figure 1. PRISMA (Preferred Reporting Items for Systematic Reviews and Meta-Analyses) flow chart of included studies. The following data items were extracted for each study: (1) study identification items (first author, year of publication), (2) study design characteristics (sample size, control group, type of assessments, length of follow-up assessments), (3) intervention characteristics (name, type, duration, level of human support or guidance), (4) prevention characteristics (type, prevented disorder), (5) dropout rate, (6) target population (eg, risk group), and (7) clinical outcomes (onset and/or severity of disorder including means, variances, as well as effect sizes). In case of deficient or missing outcome data, authors were contacted and data were requested. To ensure accuracy, a second reviewer rechecked the extracted data. To evaluate the quality of evidence, the risk of bias was assessed for each study according to the Cochrane Collaboration’s tool for assessing risk of bias in RCTs . The assessment was rechecked by a second reviewer. As recommended, each study was reviewed for procedures in the following domains: (1) random sequence generation, (2) allocation concealment, (3) blinding (3a – of participants, 3b – of personnel, 3c – of outcome assessors), (4) incomplete outcome data (4a – dropout rate (≤ 20% for short-term follow-ups, ≤ 30% for long-term follow-ups), 4b – intention-to-treat analysis), (5) selective outcome reporting, and (6) other threats to validity (6a – similar groups at baseline, 6b – no or similar cointerventions between intervention and control groups, 6c – compliance, 6d – identical timing for outcome assessment). Studies were rated as showing a “low” or “high” risk of bias according to the aforementioned criteria. For studies with at least 6 fulfilled criteria and no serious flaws, the risk of bias was evaluated as being low according to Furlan et al . Less than 6 fulfilled criteria or serious flaws yielded a rating of “high” risk of bias. Of note, in the implementation of psychological interventions, blinding of health care providers (if a guided intervention was provided) or patients concerning the treatment is not possible. This results in a “high” risk of bias rating on this criterion. However, outcome assessors can remain unaware of the treatment allocation of patients. If onset data were available, IRR and NNT were calculated. When there were at least 5 studies with available severity data within one disorder (as primary and secondary outcome), a meta-analytically pooled effect size was calculated, and effect sizes were illustrated in forest plots. Meta-analyses were conducted using Review Manager 5.3 (Cochrane Collaboration, 2014). Standardized mean differences (SMDs) with 95% CIs were computed for all continuous outcomes. Random-effects meta-analyses were performed to compute overall estimates of treatment outcome. The I2statistic was used to examine study heterogeneity . Consistent with Sterne et al , a funnel plot examining publication bias was not examined due to the limited number of included studies. Follow-up periods were subgrouped into short-term (post assessment), medium-term (≤ 6 month), and long-term (> 6 month) follow-ups. Subgroup comparisons were not feasible due to the low number of studies included. The systematic database search yielded 1600 hits. After removing duplicates, screening titles, abstracts, and full text papers for inclusion, conducting a reference search, searching trial registers for eligible studies and contacting authors, a total of 17 studies met eligibility criteria and were included in the review. The selected studies targeted the prevention of EDs, depression, anxiety, post-traumatic stress disorder, generalized anxiety disorder (GAD), or a combination of these mental disorders [39-56]. Five of 17 studies were classified as having a high risk of bias and the remaining 12 studies were classified as having a low risk of bias (Table 2). Sequence generation (1) was mostly met; only 3 studies were categorized as unclear. Allocation concealment (2) was met in almost half of the included studies, otherwise categorized as unclear as it was not sufficiently specified. Blinding of participants (3a) was met in 2 studies with active control groups [42,50]. Blinding of personnel (3b) was set on “no” without exception. As blinding of personnel is not possible for most psychological interventions, it must be considered a possible source of bias. However, outcome assessors remained unaware of the treatment allocation (3c) in 4 studies [40,42,43,51]. Regarding dropout rate (4a), only 7 studies met the predetermined criterion (≤20% for short-term follow-ups, ≤ 30% for long-term follow-ups). Ten of the included studies reported the use of an intention-to-treat analysis (4b); the remaining studies were categorized as unclear. Two studies reported results incompletely [39,48]. (5) Particularly for Jacobi et al  this can be regarded as serious flaw, since results of a clinical interview (SCID) were not reported. About half of the studies reported similar groups at baseline (6a) in demographics and outcome measures. Some studies reported differences in one demographic variable, which was subsequently used as a covariate ; alternatively, if the manuscript did not address this variable, the study was categorized as unclear. Two serious flaws were catalogued on this category because of disregarded baseline differences in outcome measures [43,53]. There were no cointerventions (6b) in any study. Compliance with interventions (6c) was rated acceptable in two thirds of the included studies. One study  received a serious flaw because of a very low compliance and significant between groups difference (combined with a relatively high dropout rate). (6d) Outcome assessment was timed similarly for all groups except for 2 studies [43,46] that used a cohort design. To evaluate the risk of certain biases (selection, performance, detection, and attrition bias), the criteria can be grouped into randomization, blinding, outcome, and withdrawal criteria. Selection bias could only be ruled out in 3 studies [41,47,52] that fulfilled all 3 randomization criteria (1) sequence generation, (2) allocation concealment, (6a) similar groups. Performance bias could be present in every study. As mentioned previously, blinding was only insufficiently possible for all studies. Hence, criteria concerning expectation and performance effects (3a – blinding of participants, 3b – blinding of personnel, 6b – no cointerventions, 6c – compliance) were never completely fulfilled. Concerning detection bias, 3 studies [40,42,51] fulfilled both criteria of outcome assessment (3c – blinding of outcome assessors, 6d – identical timing for outcome assessments). Three studies [45,47,54] fulfilled both criteria concerning withdrawals from studies (4a – dropout, 4b – ITT); the remaining studies could be affected by attrition bias. Many studies administered measures of a variety of mental disorders. Hereinafter included studies are arranged by their main focus. For an overview of all included studies, see Table 3.
cAssignment generated by an independent person who is not responsible for determining the eligibility of participants. dIntervention and control group are indistinguishable for the participants. eIntervention and control group are indistinguishable for the care providers. fIntervention and control group are indistinguishable for the outcome assessors (for patient reported outcomes, it is adequate if patients are blinded). gDropout must be described and reasons must be given, for short term follow-ups (eg, 3 months) 20%, for long term follow-ups (eg, ≥ 6 months) 30% should not be exceeded. hITT: intention-to-treat; all randomized patients are reported and analyzed in the group they were allocated to by randomization. iResults of all pre-specified outcomes have to be adequately and completely reported. jGroups should not differ significantly at baseline regarding demographics and outcomes. kThere are no cointerventions or they are similar between intervention and control groups. lAcceptable compliance with the intervention (eg, intensity, duration, number, frequency of sessions). mIdentical timing of outcome assessments for intervention and control groups. n≥ 6 x “Yes” and no serious flaws indicates an overall low risk of bias; < 6 x “Yes” or serious flaws indicates an overall high risk of bias. oSerious flaw: Results of diagnostic interviews not reported. pSerious flaw: Very high dropout and very low compliance rate. qSerious flaw: Baseline differences between groups, very low compliance. rSerious flaw: Baseline differences between groups in several scales. Table 2. Risk of bias assessment. aDropout-rate from baseline to the longest available follow-up. The systematic search yielded 6 studies on eating disorders. Four evaluated the effectiveness of StudentBodies, an Internet-based intervention for young women at risk of developing an eating disorder or with subthreshold eating disorders. StudentBodies was originally developed and evaluated in the United States [43,44] and was later translated to the German language [39,40]. The program makes use of common CBT principles and includes a Web-based discussion group. Also inspired by StudentBodies, Zabinski et al  developed a moderated synchronous group intervention for college-age women, called Chat Room. The main difference to StudentBodies is the integration of a synchronous communication chat room that enables participants to communicate more directly with each other. Stice et al  developed and evaluated the eBody Project, an Internet-based version of a CBT-based eating disorder prevention group-program. eBody is a dissonance-based intervention encouraging young women to question the popular “thin” ideal. The search yielded 3 prevention programs focused on the prevention of depression. Surviving and Thriving with Cancer  is an assisted Web-based education course aimed to foster positive health behaviors in cancer survivors. In addition to depression, intervention effects on health conditions as nutrition, exercise, and sleep were examined. The guided Internet-based CBT program (iCBT) by Imamura et al  conveys stress management skills to employees of 2 information technology (IT) companies with subthreshold depression. The intervention aims to prevent major depression episodes. It includes common CBT elements such as self-monitoring or relaxation techniques. Thompson et al  adapted a mindfulness-based prevention program (UPLIFT) for epilepsy patients with mild-to-moderate depressive symptoms . The telephone- and Web-based intervention makes use of psychoeducative principles (eg, knowledge about depression, importance of reinforcement) and mindfulness-based tools (eg, monitoring of thoughts). The 6-week Web-based insomnia program SHUTi by Christensen et al  aims at the high co-occurrence of insomnia and depression. Overall, 1149 participants were recruited via the social network platform Facebook and randomized to either a CBT-based insomnia intervention or a control website (HealthWatch). Two studies focused on combined anxiety and depression. A self-guided intervention promoting well-being in a general population was tested by Mitchell et al . In 3 weekly sessions, users completed either an interactive program focusing on strengths (intervention 1, based on positive psychology principles) or problem-solving skills (intervention 2). Users received feedback and email reminders. MyCompass , a self-guided computer-delivered intervention, aims to foster self-management and self-monitoring skills in people with mild-to-moderate depression, anxiety, and stress symptoms. Content in the 12 modules was derived from CBT, interpersonal psychotherapy, problem-solving therapy, and positive psychology. Users are also provided with text messages or emails containing reminders and material on psychoeducation. There were 2 studies that focused on post-traumatic stress. The self-guided Trauma TIPS  aims to prevent PTSD in injury patients. CBT techniques such as psychoeducation, stress management, and in vivo exposure are presented in the 30-minute program alongside contact information for professional help and a Web forum for peer support. Cancer Coping Online, a self-guided Web-based CBT program for reducing distress in patients currently receiving cancer treatment, was evaluated by Beatty et al . The 6-session program mainly focuses on coping strategies taught via text, audios, and worksheets. Besides posttraumatic stress (cancer-specific distress), levels of depression and anxiety (general distress) were evaluated. The search yielded 2 studies on GAD. MoodGYM  is a fully automated Internet-based program that teaches CBT skills (eg, psychoeducation, relaxation, or mediation techniques) to improve mental well-being in a general population. Besides well-being, depression and GAD data were gathered. Because the mean depression score of the participants exceeded a clinical cutoff (and thus did not fulfill inclusion criteria), only GAD data were included in this review. Christensen et al  evaluated the program iChill, which aims to prevent GAD in young adults with mild GAD symptoms. iChill is an active website. The intervention makes use of multiple CBT tools as psychoeducation, relaxation, or toolkits. Telephone reminders for participants without therapeutic purpose were included in one trial arm. Musiat et al  developed a transdiagnostic trait-focused program (PLUS) aiming to prevent common mental disorders. Investigated disorders were depression, GAD, EDs, and alcohol misuse. The CBT-based program focuses on the identification of strengths and the consolidation of coping strategies and includes computerized feedback. Five studies reported incidence data allowing for the calculation of onset, IRR, and NNT (see Table 4). Christensen et al [48,55] did not observe significant group differences in onset. Imamura et al  reported a significant onset difference for the 12-month follow-up period (1.26% for the intervention group, 5.51% for the control group). Calculations yielded an IRR of 0.23 and a NNT of 23.48. Taylor et al  found an onset of 4.00% in the intervention group, compared with 6.60% in the control group. This yields an IRR of 0.63 and a NNT of 41.31. Thompson et al  found a 0% onset for the intervention group and a 10.70% onset for the control group. In accordance to the Cochrane Handbook for Systematic Reviews , a correction of 0.5 was added to the zero incidence in the intervention group, resulting an IRR of 0.09. The NNT was 9.33.
eA correction of 0.5 was added to the zero incidence in the intervention group for IRR calculation. Severity data were extracted for all included studies. Eleven studies found significant effects on symptom severity with small-to-large effect sizes (d=0.11 to d=0.76), indicating differential intervention effects on group, time, or interactions of both respectively [39-41,43,45,47,51-55]. For the meta-analysis of depression interventions, we included studies with depression as a primary and secondary outcome. In cases of multiple active groups, only the main intervention sample was analyzed [48,50]. Results for short-, medium-, and long-term follow-up are presented in Figure 2,Figure 3, and Figure 4, respectively. In summary, pooled effect sizes, indicating a greater decrease in symptom severity for the intervention group, were small but significant. For short-term follow-up, our calculations yielded an effect size of SMD = −0.35 (95% CI, −0.57 to −0.12, P=.002). Test of heterogeneity was significant (P<.001; I2= 79%). Effect size for medium-term follow-up was SMD = −0.22 (95% CI, −0.37 to −0.07), P=.005. Heterogeneity was significant (P=.02; I2= 57%). For long-term follow-up, an effect SMD = −0.14 (95% CI −0.36 to 0.07, P=.18) was found. Heterogeneity was not significant (P=.17; I2= 38%). According to Higgins et al , overall level of heterogeneity was moderate to high. Figure 2. The effects of preventive interventions on symptom severity of depression at short-term FU—comparison experimental versus control group. Figure 3. The effects of preventive interventions on symptom severity of depression at medium-term FU—comparison experimental versus control group. Figure 4. The effects of preventive interventions on symptom severity of depression at long-term FU—comparison experimental versus control group. An ICTRP search for ongoing trials yielded 570 records for 560 trials (years 2005-2015). Sixty-two records were selected as likely being relevant. Most of those were planned studies on symptom severity as a secondary outcome and with different study purposes. Eleven records aimed to assess severity data and had an explicit preventive goal. Targeted conditions were mostly mood and anxiety disorders. Seven studies planned to use clinical interviews for diagnostics or to explicitly gather incidence data. Three studies of those studies were already published, one of them is included in this review  and 2 were excluded because of high symptom severity or diagnosis (inclusion criteria 2) at baseline [59,60]. Another planned study on depression had been withdrawn before enrolment because of missing funding (ClinicalTrials.gov, registration no. NCT01080105). Of the remaining 3 records, one study is planned on the prevention of psychosis for people with psychotic like experiences (Australian New Zealand Clinical Trials Registry, registration no. ACTRN12612000963820). The other one concerns the prevention of depression in people with complicated grief (UMIN Clinical Trials Registry, registration no. UMIN000007331). Our own research group also conducts a clinical trial on the prevention of depression in the risk-group of back pain patients with subthreshold depressive symptoms, which is registered at the German Clinical Trials Register (registration no. DRKS00007960). Inspection study protocols emerging from the data base search yielded ongoing trials for the prevention of depression [61-64] and PTBS . 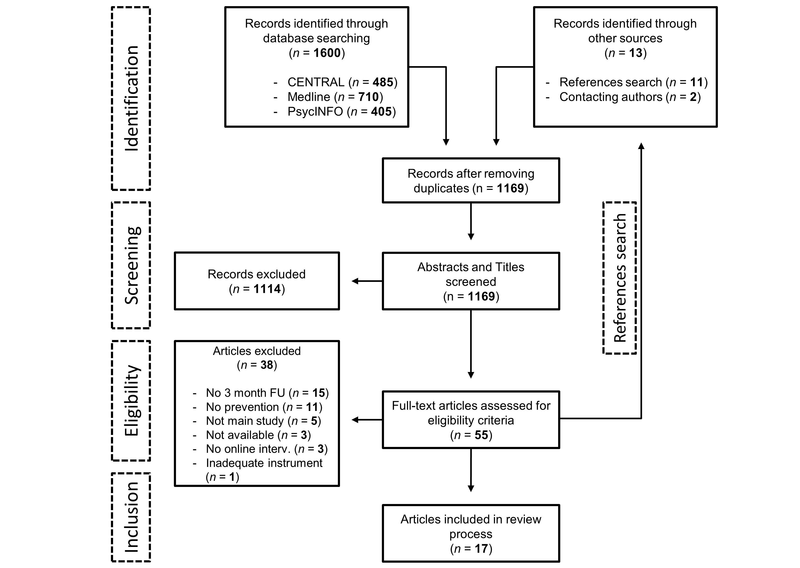 This review and meta-analysis systematically summarizes previous research on Internet-based interventions for the prevention of mental disorders. It therefore exceeds the informative value of existing reviews (eg, [23,67]) in terms of the range of included disorders and gives an extensive overview of the actual state of research. Seventeen RCTs were included in this review and described in detail. Results are in line with previous meta-analyses, showing that indicated and selective prevention is more common than universal prevention  and that CBT is a frequently (sometimes even exclusively) used Internet-based intervention type (eg, [24,66]). Quality assessment suggests that 5 included studies have a high risk of bias. Some biases are inevitable (eg, blinding not possible for psychological interventions). Others, such as biases due to inappropriate randomization, can and should be avoided. Of note, 3 studies were classified as having high risk of bias solely due to a serious flaw. Reasons for study classification as having a serious flaw included baseline differences between intervention and control groups [43,53], very low compliance with the intervention [50,53], and a very high dropout rate . Concerning study dropout, the Cochrane guideline  provides a rather conservative appraisal when applied to IMIs . When evaluating treatment dropout, a more differentiated perspective can be beneficial. In a recent meta-analysis, van Ballegooijen et al found that IMIs regularly have lower completer rates of total interventions when compared with face-to-face treatments (65.1% vs. 84.7%), but are equal in the percentage of average completed sessions (face-to-face CBT: 83.9% vs. iCBT: 80.8%) . Above that, participants do not necessarily have to complete all sessions to benefit from IMIs. They may stop the treatment because they already obtained benefit, and therefore, these cases would represent a success, rather than a treatment dropout [69,70]. Three of 5 studies reporting incidence data provided evidence for a preventive effect of the investigated interventions [43,49,54]. One study failed to report the results of a diagnostic interview, which would have allowed calculating incidence rates . The remaining studies by Christensen et al [48,55] did not find effects on reduction of new cases. However, secondary outcome measures of anxiety and depression symptoms showed positive effects. The included incidence studies differed in the length of follow up-periods. Thompson et al  only had a pre-post comparison. For the remaining studies, incidence reduction could be observed over a 12-month follow-up period [43,49], suggesting that preventive interventions have the potential for incidence reduction in the long term. Nevertheless, severity data show positive effects of interventions in 11 of 17 studies with small-to-medium effect sizes. The best evidence was found for ED and depression. Beintner et al  previously conducted a meta-analytic review on most included ED studies, demonstrating mild-to-moderate effects on ED-related attitudes (d=0.15 to d=0.57). The only study not included in Beintners’ review  found similar effects. The Internet-based intervention was superior in the reduction of ED symptoms compared with the 2 control conditions (d=0.33 and d=0.19) at the long-term follow-up (1 year). Our meta-analysis on IMIs for depression showed an overall small but significant reduction in symptom severity. As mentioned before, this demonstrates an effect of IMIs on the treatment of subclinical depression; a subsequent reduction of incidence can only be assumed, as most included studies did not report incidence data. Because of moderate to high levels of heterogeneity, the actual effect size values should be interpreted with caution. Nevertheless, heterogeneity results from estimates showing the same direction of effect favoring interventions over control groups. In summary, evidence was found for effectiveness of interventions for EDs, depression, and anxiety. Internet-based interventions can be considered effective in reduction of subthreshold symptomatology and may also be suitable for preventing the onset of mental disorders over the long term. Depression and anxiety are of particular clinical relevance against the background of prevalence rates: as mentioned, anxiety disorders, insomnia, and major depression are the most common mental disorders in the European Union . Although many IMIs include modules on sleep or relaxation (eg, [47,50]), Christensen et al  reported the first prevention RCT explicitly targeting insomnia resulting in a reduction in depressive symptomatology. A number of potential limitations and challenges regarding this study should be acknowledged. As usual for reviews and meta-analyses, publication bias  must be assumed. This review included several studies reporting not expected or nonsignificant results; nevertheless, publication bias cannot be precluded. Furthermore, the search might have been confounded by language bias because only English and German papers were included. Fortunately, in contrast to publication bias, this only minimally impacts conclusions . Another limitation concerns the inclusion of studies that reported mean scores only and did not clearly state that participants did not exceed clinical cutoffs at baseline (second exclusion criterion). This became evident after contacting authors to obtain raw data and subsequently computing incidence and onset rates if they had not already been reported. Four of those studies [73-76] had to be excluded because inspection of the raw data revealed that a considerable number of participants exceeded clinical cutoffs at baseline, even though the other eligibility criteria had been fulfilled. Unfortunately, only a few authors responded to our requests for additional information. Thus, it cannot be ruled out that this might also be the case for some included studies, that is, those which reported mean scores and did not provide raw data. One major challenge of this broad review was the handling of variability between studies. Although heterogeneity was expected, and even welcomed to map out the broad scope of existing e-mental health prevention interventions, it must be taken into account when interpreting the findings. There are several sources of heterogeneity. First, this review was not restricted to one mental disorder but included a number of clinical conditions. Second, methods to determine the clinical status of participants, such as structured clinical interviews or self-report questionnaires, differed between studies. Third, intervention contents were different. As mentioned previously, most interventions were based on CBT, but other intervention types were included as well. Fourth, study design caused heterogeneity, due to different types of control groups, varying follow-up assessment periods and different sample sizes. For the meta-analysis, pooled effect sizes were calculated for depression and grouped into 3 follow-up periods. Nevertheless, different sample sizes can lead to overweighting of the larger size studies. To gain insight into requirements for future research, limitations of the presented studies should be considered. First, the 5 included incidence studies were planned with preventive goals and used standardized clinical interviews for valid diagnosis. The remaining studies were often planned for other purposes (eg, improving well-being), and mental disorder symptoms were gathered by means of self-report questionnaires. Therefore, additional incidence studies using valid diagnostic instruments are needed, especially in light of the ICTRP search results, which revealed that very few incidence studies are planned in the near future. Second, the evidence base is limited to a handful of disorder groups specifically EDs, depression and anxiety. Research could expand to the missing subfields, for which Internet-based prevention could be applicable. It is noteworthy that one ongoing trial targets prevention of psychosis . Third, this is the first exhaustive review on Internet-based prevention for mental disorders in adults. One could expand the scope to additional domains and populations, for instance to relapse prevention in mentally ill persons. As there are already several studies on this topic (eg, [78,79]), a systematic review would be beneficial to provide an overview of the current state of research. Another potential field of study could be Internet-based prevention of mental disorders in children and adolescents. There is already one review on this topic , which is limited to depression and anxiety, but could be expanded to include other mental disorders. Fourth, most Internet-based interventions included in this review had no additional human support component (ie, unguided). Although this results in a reduction of initial costs, it is also accompanied by a reduction of effectiveness . To date, there is no study investigating whether or not this reduced effectiveness translates into an increase in costs over the long term, due to (for example) increased health care utilization or work incapacity days. Internet-based interventions can be effective in the primary prevention of mental disorders. The body of research is still limited to a few mental disorders (EDs, depression, anxiety disorders). Therefore, further high-quality studies are required, using standardized clinical interviews and gathering incidence data in long-term follow-ups. Because of the advantages of Internet-based interventions such as cost-effectiveness, availability, and flexibility [16,17], this can be a fruitful area for research. Content could be adapted for use with other disorders and populations. Furthermore, interventions that have been found to be effective in preventing certain mental disorders can and should be implemented into practice. Health care costs and personal, social, and financial burdens of the affected and society can consequently be reduced. The authors would like to thank Yannik Terhorst for proofreading of the manuscript and Mary Wyman for language editing. The article processing charge was funded by the German Research Foundation (DFG) and the Albert Ludwigs University Freiburg in the funding program Open Access Publishing. Personnel resources granted Federal Ministry of Education and Research, Germany (project: Effectiveness of a guided web-based intervention for depression in back pain rehabilitation aftercare, grant number: 01GY1330A) supported the realization of this review. The funders had no role in study design, data collection and analysis, decision to publish, or preparation of the manuscript. LS, LR, and HB were involved in the concept and design of the study. LS and LR had major contributions to data extraction and analysis. All authors had major contributions to the write-up and editing of the manuscript and read and approved the final manuscript. First MB, Spitzer RL, Gibbon M, Williams JB. The Structured Clinical Interview for DSM-IV Axis I Disorders (SCID-I) and the Structured Clinical Interview for DSM-IV Axis II Disorders (SCID-II). Washington, DC: American Psychiatric Press; 2002. First MB, Gibbon M. The Structured Clinical Interview for DSM-IV Axis I Disorders (SCID-I)the Structured Clinical Interview for DSM-IV Axis II Disorders (SCID-II). In: Hilsenroth MJ, Segal DL, Hersen M, editors. Comprehensive Handbook of Psychological Assessment, Volume 2, Personality Assessment. US: John Wiley & Sons Inc; 2004:134-143. ©Lasse Sander, Leonie Rausch, Harald Baumeister. Originally published in JMIR Mental Health (http://mental.jmir.org), 17.08.2016.